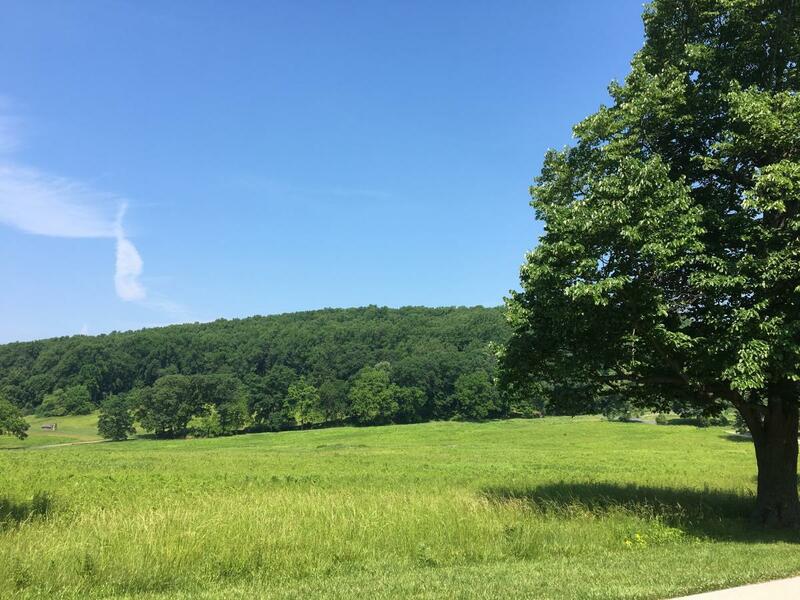 As summer 2017 continues to unfold, Valley Forge National Historical Park’s guided bicycle tours are easily accessible. 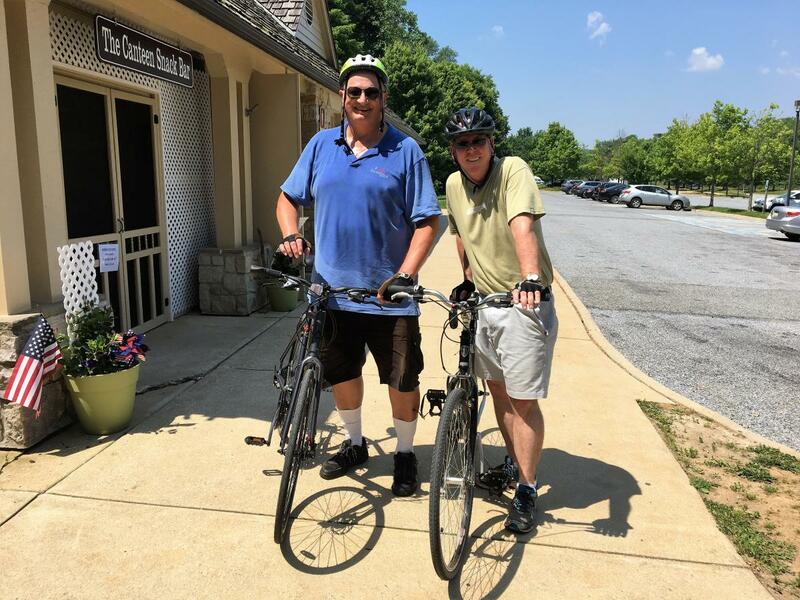 Each Saturday from now until September 7, these two-wheeled excursions create a one-of-a-kind adventure. Having never “officially” explored the park from behind a set of handlebars, I made a reservation through The Encampment Store and saddled up. Bikes can be rented ($25 for adults, which includes the fee for the tour), or riders can bring their wheels from home. I chose the latter and after unloading my bike from the car, I met my guide, Randy Rice. Rice’s journey to bicycle tour guide came after a tech career and a love of cycling, including participation in long-distance rides. 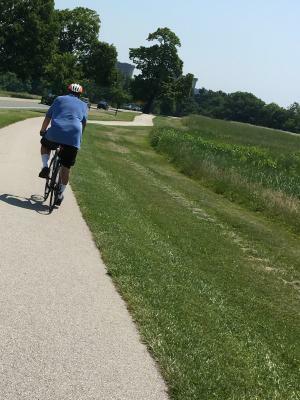 For the past nine years, he’s been telling Valley Forge’s story, bringing visitors through the park, propelled by pedal power. “People think they know this story,” he says. 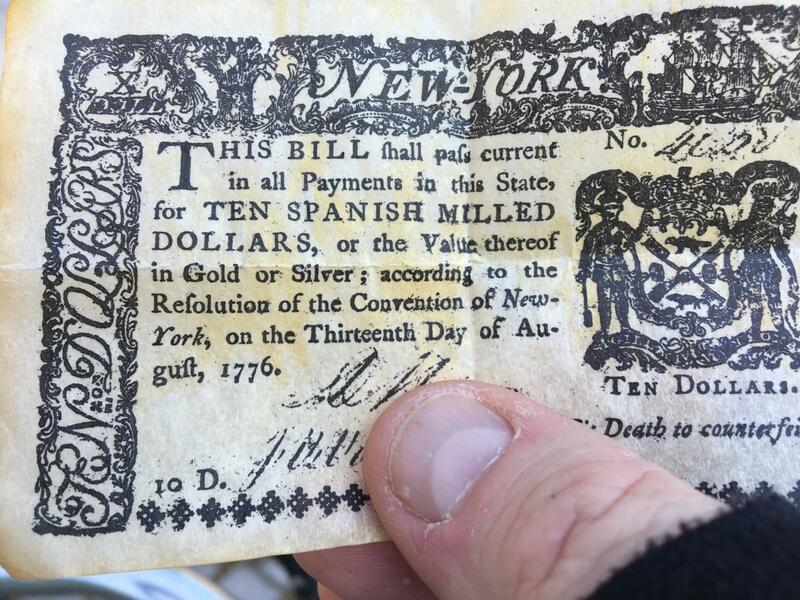 “They think the Revolution was all about taxes. That’s a short-sighted view. It was about so much more. It was about unfair trade policies and unreasonable merchant fees and arbitrary law enforcement and religious oppression. We shove off from the bike rental kiosk – newly renovated and more permanent than the trailer it replaced – and head for the Muhlenberg Huts. There, Rice depicts the woeful condition of the army as it arrived in December 1777. But he also sheds light on the conditions that resident farmers faced. “If a family knew that the army was arriving, either side,” he said, “it became obvious pretty early on that they best clear out. The Continental soldiers took the 22 farms on this site and pretty much decimated them. “Between the 2,000 huts and the miles of defensive trenches that were built, this land was unfarmable for decades after the war. We glide off to the Memorial Arch. From the vantage point of the bicycle seat, it’s easy to imagine that I’m on horseback, trotting through the encampment to update General Washington on the status of the soldiers. We discuss the politics and economics of war, including the worthlessness of Continental currency. Rice pulls a few examples from a leather sack in his pocket. We climb to the Wayne Statue. Rice uses this setting to describe military discipline. It is here that Rice’s knowledge surprises me. He states that per Batman canon, Anthony Wayne was distantly related to millionaire Bruce Wayne. We descend, paralleling the Joseph Plumb Martin Trail. And as we gaze off toward Mount Joy, I learn something else. The field in front of the peak was a burial site for nonmilitary personnel. To conserve space, the waggoneers, sutlers and camp followers who died at Valley Forge were interred with their knees bent to their chests. Pedaling easier now that were no longer climbing, we cycled our way back to the Visitor Center, stopping at Artillery Park, the Von Steuben Statue and the Monument to Patriots of African Descent. As we wind down the tour, Rice gets somewhat philosophical. “People say there were no battles here,” he states. “But there were. The men battled disease and deprivation. They battled the elements, the snow, the wet, the mud. 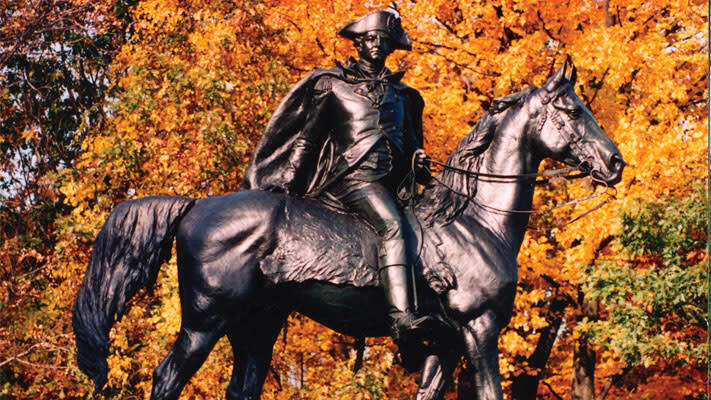 Washington battled an effort to remove him as Commander-in-Chief. Von Steuben battled the pride of regionalism that pitted fellow soldier against fellow soldier. 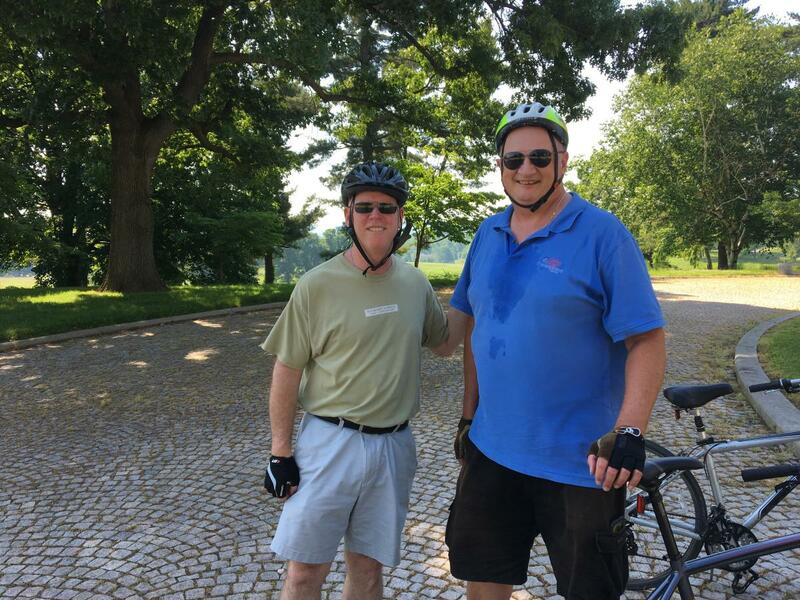 Guided bike tours of Valley Forge National Historical Park are offered each Saturday (weather permitting) until September 2 at 10:30 a.m. Tours depart from the bike rental stand in the lower parking lot. For the tour plus a rented bike, the cost is $25 per adult, $15 per student ages 12-17. For riders bringing their own bike, the cost is $17.50 per adult and $10 per student. Riders must be at least 12 years old, and helmets and closed-toe shoes are required. For more information, including details on private tours, contact The Encampment Store at 610.783.1074.